If you are looking for the perfect pressure washer for everyday use around the house, then look no further. The Pressure Washer is the perfect machine for cleaning around your house, car and yard. You will find yourself using it more than you would have imagined. 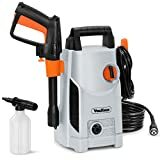 Although you may be skeptical at first because of the small size, you will quickly find this pressure washer to be an indispensable tool around your home. Compatible with Kärcher G 4.10 M & G 7.10M. A range of accessories are Included that are ideal for cleaning large areas of patios & Decking, etc., as well as for cleaning cars, bikes and all other vehicles. On-board storage: Telescopic handle, storage for the high pressure gun, full control lances and cable. The hose can be wound in after use onto the integrated hose reel. The karcher K4 premium full control car & home comes complete with a 5 year Warranty. Includes a one-way and Dirt blaster lance - Ideal for cleaning delicate surfaces such as car, or harder surfaces like stone and brickwork. Lightweight construction - The lightweight design makes it easy to transport whilst cleaning. On-board storage - Trigger gun, hose and lance can all be stored neatly on the machine.